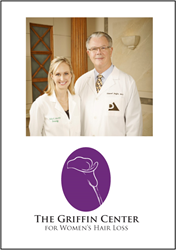 Prominent Atlanta hair restoration surgeons, Dr. Edmond Griffin and Dr. Ashley Curtis, establish The Griffin Center for Women’s Hair Loss, the first center in Georgia exclusively devoted to addressing the unique issues associated with women’s hair loss treatments. Our experience research has found that women’s hair loss requires specialized diagnostic methods and treatments that are often very different from those that are traditionally used to treat men. The Griffin Center of Hair Restoration and Research is proud to announce a new center exclusively devoted to addressing the unique issues associated with women’s hair loss treatments, including hair restoration surgery, The Griffin Center for Women’s Hair Loss. Hair loss in women can be very different than the forms of hair loss experienced by men. At this state of the art facility, an experienced staff of hair restoration specialists can devote the time and attention necessary to diagnose fully the specific causes of each patient’s hair loss and formulate a customized treatment plan that satisfies their individual hair restoration needs. Research published by the American Hair Loss Council has found that as many as one out of every four women can expect to experience some degree of hair loss over the course of their lives, but until recently the subject of women’s hair loss was seldom seriously addressed. Today we know that women can be affected by genetic pattern hair loss, just as men can, but that they can also suffer from hair loss stemming from a multitude of other causes, ranging from hormonal changes, menopause, thyroid abnormalities, or birth control pills, to physical stress from surgery, illness, anemia, or rapid weight loss, to the side effects of certain common medications. Understanding and addressing the many different causes of women’s hair loss, as well as exploring the most advanced treatment options, are the reasons that The Griffin Center of Women’s Hair Loss was formed. About The Griffin Center of Hair Restoration and Research: Founded in 1976 by board-certified dermatologist and dermatologic surgeon Dr. Edmond I. Griffin, The Griffin Center of Hair Restoration and Research has grown to become a world recognized leader in hair restoration treatment and one of the cornerstones of Dermatology Associates of Atlanta, a comprehensive facility with now nine on-site centers dedicated to caring for skin, hair, and nails. For nearly forty years, Dr. Griffin has devoted his career to the study of hair restoration, and surgeons from around the world have frequently visited Atlanta to observe his surgical techniques. Joined by board certified dermatologist and dermatologic surgeon Dr. Ashley R. Curtis in 2011, Dr. Griffin and his experienced staff continue to utilize the latest hair restoration techniques including follicular unit transplantation and NeoGraft for FUE.